What´s TALON6 ? 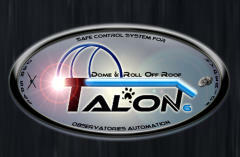 Talon6 is a safe control system for observatories automation. It allows manual control as well as robotics and automation of roll off roofs and domes for astronomical observatories. This project is supported by our security needs and experiences as users of remote domes and roll-off-roofs observatories since 2005. We have always feared that our astronomical equipment will get exposed to the elements due to a hanged PC, Internet lost, power fail, etc. Well, now we can monitor all this conditions and be a bit more relaxed, this control system, if needed, will park the mount and close the roof or the shutter for us automatically and without our intervention TALON6 uses an ASCOM compatible driver that can be controlled from PC and automation software, allowing the opening and closing of the roof automatically at the beginning and end of the photo session and accurately positioning the roof or dome and dome shutter at a particular point. TALON6 moves the motors silently (microprocessor controlled), accelerating smoothly up to the maximum speed until it has to decelerate to smoothly stop at the destination point. There are three different models: ROR For Roll-off-Roofs with our motor with integrated encoder. ROR DUO With 2 Motors for Roll-off-Roofs with more than 1000kg of weight. ROR-RELAY Roll-off-Roofs with 230V motors already installed by the user. DOME For domes with motorized dome and shutter using 2 of our motors with integrated encoder. We can adapt to different motor configurations, consult with us. TALON6 R.O.R/ notifies continuously the status of the roof. Open (magnetic sensor limit switch) Closed (magnetic sensor limit switch) Position of the roof (exact percentage by encoder, or by moving time in 220V motors). Last action performed. Continuous Current status of the sensors and switches shown by light signals in the driver main display. It also monitors continuously the following safety conditions: Communications with the PC lost. Internet communications lost. Cloud watcher, Cloud Sensor, etc. sensor switch. Power fail (before UPS, Uninterruptible Power Supply) Mount at park position. Countdown to a scheduled shutdown. External keypad. Lock and unlock the driver for observatories group, parking all telescopes before closing the observatories. Talon6 is able to react safely to any of these eventualities ordering the mount to park and ordering the roof to close. Additional Features Direct communications several mounts (through a serial port) to order them to park without PC intervention (covers the communication lost problem). Includes an specific contact Switch to park Paramount mounts without PC intervention. Direct connection to the IP-SWITCH for automatic equipment switch-off at the end of the session or after a safety closing. Automatic communications port reconnection after PC disconnection. Automatic communications port search at the beginning of the connection. Maximum aperture control with unparked mount. Possibility of manual Synchronization of the current roof position. Basically TALON6 will park the mount and will close the roof when any of the above mentioned conditions appear, except (in general) when the communications with the PC is lost (due to hanged or switched off PC). In this case the roof will be closed with the mount unparked, unless the user configure the system to avoid this closing order. In addition when the user is at the observatory, TALON6 can be governed manually with a keypad included in the control box, which allow the orders Open, Close and Stop. The system can also be governed remotely by activating an additional input (for example using a GSM controlled or IP controlled relay) . With TALON6 R.O.R/the following items are provided: Talon 6 controller. Geared Motor 12v 1/75 (Not in TRIAC). M4 Steel spur gear (Not in TRIAC) . 5mm thick Steel motor mount with manual release (Not in TRIAC). 12V 10A switching Power Supply (in TRIAC 5V 2A). Motor encoder (Not in TRIAC). up to 4m steel rack (Not in TRIAC). Two magnetic sensors with 7m cable (Mount at park sensor). Two magnetic sensors 1m cable (OPEN/CLOSED limit switches). 1m cable for connecting the CloudWatcher switch. 1m cable for connecting the "remote command". Output for IP-Switch connection. 5m USB Cable. All sensors and wiring are already connected and placed inside the TALON6, It is enough to extend the cables and position the sensors in the places chosen by the user, using screws or double-sided tape . The price of the equipment is: TALON6 R.O.R 990 €. TALON6 R.O.R-DUO 1.880 € TALON6 R.O.R-RELAY 810 €. TALON6 DOME 1.990 €. ( Battery, charger solar panel and controller )+ 350 € ( Controler and motor Lower Shutter Opcional ) + 680 € GSM-SWITCH 295€ IP-SWITCH 280 € IP-SWITCH 8 SHUKO 490€ TAPI 120€ (Shipping included in Spain) VAT not included. If you already have the motors installed we can adapt our system to your setup ... .contact us. Antonio Perez: aperez@fi.upm.es Miguel Ángel García: miguelang555@gmail.com For a clearer perception of the use and characteristics of TALON6. Read the manual ROR or Manual DOME (Updated on February 24, 2019 for the latest version) Driver ROR: ver-03.08 Driver ROR T6R: ver-01.00 Driver ROR: INDI ver-01 ( Developer: Ferrante Enriques, for compatible firmware versions) Driver Dome: ver-03.06 Firmware ROR: ver-03.09 Firmware Dome: ver-03.03 Firmware Shutter: ver-03.03 If you want to update your TALON6, let us know by our WhatsApp group or by e-mail. We can send you upgrade by email.